For over thirty years the computer mouse ruled over the kingdom of computer navigation. Despite losing its rubber ball and cord over the years, the peripheral lived a long, full life of being pushed across desks and tables getting the cursor where it needed to go. It died today from neglect as it was abandoned en masse for touchpads and touch-based computers. Many tech pundits have already started drafting an obituary of the computer mouse like the one above, but let's be clear: we think the death of the mouse is greatly exaggerated. In fact, we're so convinced the mouse isn't dead that we've been testing some of the best on the market for the last couple of months. Click on below to find out why we think the lowly mouse has more than a few good years left, and which ones out there deserve your attention. Sure, the mouse may one day perish to fancy new touch operating systems and better multitouch hardware, but that's just not the computing world we currently live in. Let's start with the biggest issue: terrible trackpads. Readers of our laptop reviews are certainly not strangers to the fact that many systems – big and small -- are riddled with quite unsatisfactory trackpads. Sometimes, like with HP's ClickPads, that's a result of poor multitouch software that attempts to try and enable more finger gestures but ends up ruining the basic navigation experience -- we often wonder if anyone uses some of these laptops before shipping the out. Other times, it's simply the result of uncomfortable and poor hardware, like with Dell and Gateway's newest systems which can be so frustrating and physically painful to use that there's no other option than to reach for an external mouse. That's not to say some trackpads aren't close to perfect – Lenovo's dimpled ThinkPad surface and Apple's aluminum multitouch touchpad are two of the best -- but even then there are some that find flat surfaces uncomfortable for long periods of desktop navigation. No matter how you slice it, Windows 7 and Mac OS X are still very much mouse-based operating systems. But trackpads will soon be a thing of the past as touch-based operating systems that are completely oriented around finger input take over, right? Well, not any time soon. The iPad may represent an early move towards larger touchscreen interfaces, but the iPad is a secondary device, and our primary desktop operating systems were built with the mouse as the primary means of control. Simply replacing the mouse with touch leads to inconsistent experiences -- just look at the Windows 7 laptops with touchscreens that have popped up recently. While the OS is more touch-capable than previous Windows OSes, users cannot rely solely on touch -- another method of pushing the arrow around is required. No matter how you slice it, Windows 7 and Mac OS X are still very much mouse-based operating systems through and through. We can't say what will be next from either company, but we do know Windows 8 isn't expected until 2012, so it looks like the majority of us will be living with the mouse for the next two years at the very least. So yeah, the mouse isn't close to being buried; heck, it isn't even on life support. And there's also the little fact that external mice are actually pretty great, and can do more than ever before with improved shortcut options and scrolling functionality. We've spent the last few months testing some of the more advanced mice on the market, so mosey on down to see how they perform. 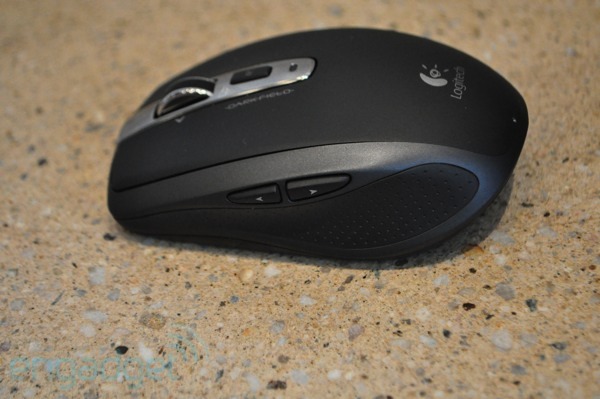 Of all the mice we have played with, the Logitech Anywhere Mouse MX stole our hearts most consistently. 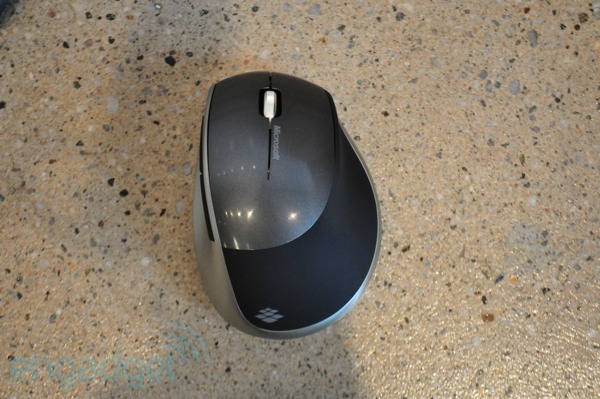 Most travel mice are too small to use comfortably as an everyday mouse and typically lack the extra controls of full-size mice, but not the Anywhere MX. It's wireless, about the size of an BlackBerry Curve, and perfectly symmetrical for both righties and lefties. Saying it's comfortable to use is an understatement if we've ever heard one – its wider body fit snugly in our hand, and it felt like its grippy coating melded to our fingers after a week or so. The MX has a scroll wheel between its right and left clickers with a shortcut button below them, as well as up and down arrows on its left side. We had no issues configuring all those on a Mac or PC with Logitech's Control Center software. Hands-down, our favorite part of the mouse is the shortcut button, which is preset to activate Windows Areo or Apple Expose. We also love that the scroll wheel can be pushed in to change from a click-to-click scrolling to hyper-fast scrolling, but the latter option doesn't have quite enough precision. The Anywhere MX also has Logitech's Darkfield laser tracking technology, which allows it to be usable on most surfaces. That's no lie, either – it worked just fine on carpet, a glass table, and on rough title flooring. Microsoft was first to market with the BlueTrack system that enables the Explorer mouse to work on any surface, but Logitech wasn't far behind with its similar Darkfield tech. Still, the Explorer is a standout option, and we're particularly big fans of its glowing blue aura and inductive charging base (honestly, who has fresh AAs lying around when you need them?). We happen to have small hands, so we didn't find Explorer's wider body to be all that comfortable, but when we lent it to a friend with larger mitts he didn't complain about the ergonomics. The Explorer is Mac and PC compatible, and there were no hiccups configuring the two narrow buttons on the left edge and the scroll button. But we're not fans of the mushy scroll wheel -- it really should have a clicking option for easier control. On a mouse of this size we'd also expect a few more buttons; we're not talking 16 more buttons like the WarMouse Meta, but just a few more so you have the option for a few shortcuts. Despite those drawbacks, the Explorer's still a solid choice for those that are looking for living room or kitchen mouse, as it did work on virtually every surface we slid it on. 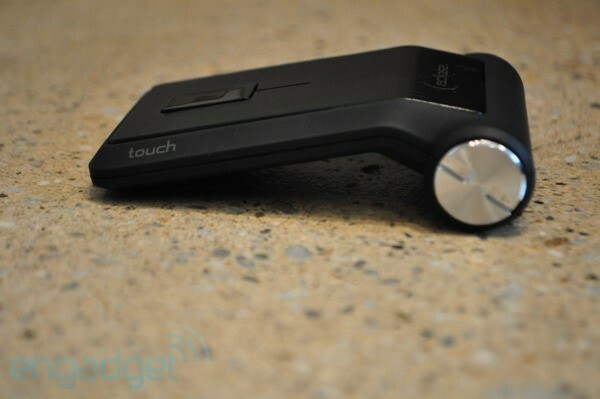 We won't lie: when we set up the Eclipse TouchMouse we didn't know what to make of it. It's crazily shaped, has a touchpad in place of the scroll wheel, and it look more like a lawn chair than anything else. However, the Eclipse is more comfortable than it looks, although we wish it were raised higher off the ground -- like the Magic Mouse, it's a bit too flat for our liking. There isn't much of a learning curve when it comes to using the touchpad. When we paired the mouse with our MacBook Pro it recognized the pad as the scroll wheel, and dragging a finger up or down was quite responsive. We couldn't get the other TouchGestures working on a Mac, but when we connected it to a Lenovo ThinkPad we were able to swipe left and right on the pad to move forward and backwards in Internet Explorer. Not a bad trick, but oddly, the basic sensitivity on the mouse had to be turned all the way down to achieve normal speeds on both the Mac and the ThinkPad. Unlike the Logitech and Microsoft, the Eclipse can't sail over carpet, but it held its own on a mirrored table. 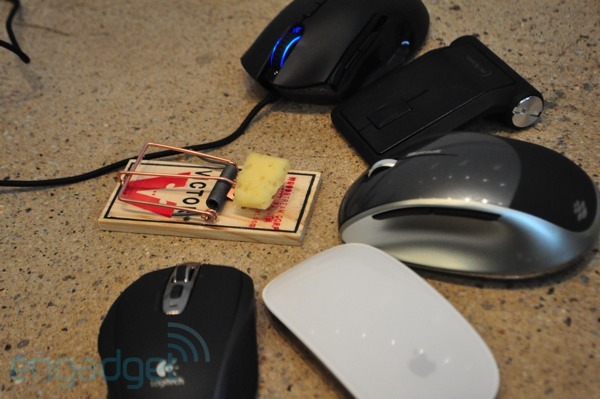 We couldn't round up a slew of new mice without including a corded, gaming option. 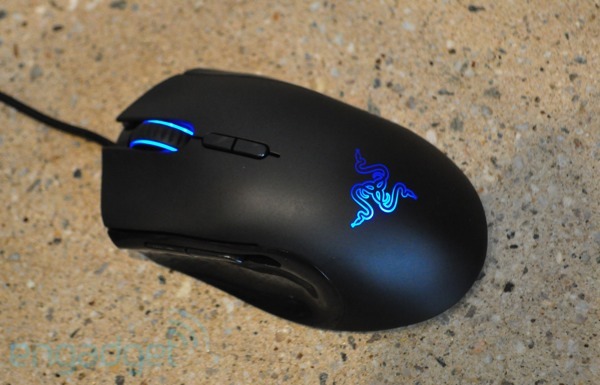 Razer's long stood out amongst gaming peripheral manufacturers, and the Imperator with its 5600dpi sensor and blue LED accents is what you want to have in hand when tearing through an MMO or first-person shooter. The Imperator really stands out in ergonomics – well, that's if you're a righty. Size-wise it's just right – not too thin or too wide, and the rubber top and scroll wheel feel pretty great in hand. The side grip is covered in a glossy plastic, and though it becomes seeped in fingerprints, it's still a cozy place to rest your right thumb. There are two vertical shortcut buttons on its face, and another duo on the left side that can actually be slid forward or backward with a switch on the bottom. It's annoying that the Imperator doesn't come with drivers, but it's easy enough to download them from its support site. (Quick note: no matter how much mice may evolve, we're convinced that mouse drivers will always be more frustrating than they really should be.) Either way, on both Mac and PC laptops we were able to easily adjust the Imperator's sensitivity and acceleration, as well as configure the five shortcut buttons. Sure, the Imperator was built for gamers, but it happens to be one of our top picks when it comes to good old fashioned comfort. 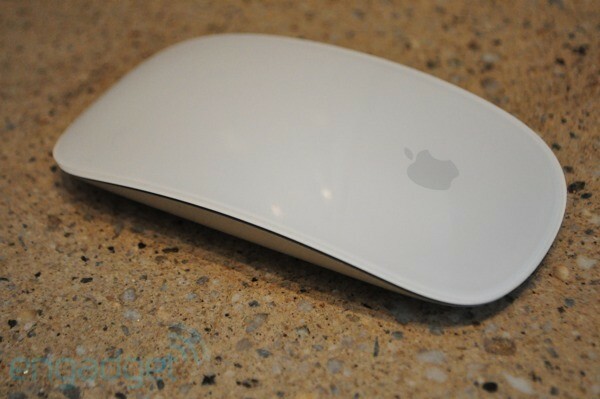 It seems only appropriate to close with Apple's Magic Mouse, as there's no other mouse out there that's such a hybrid of old and new desktop navigation ideas. When it first launched, we were impressed by its thin, minimalist and unified design, but after a few months of use, most of the Engadget staff agrees that it's just too flat and not nearly ergonomic enough for general use. And that flatness is even more apparent when it comes to using those unique multitouch gestures; we always want to have our finger propped up higher to scroll rather than keep it resting flat on the mouse. That being said, we do really like the responsiveness of the gestures, especially the single-finger scrolling and two finger forward / backward swiping. If anything our major issue is that Apple's mouse doesn't allow for enough gestures. But there's always BetterTouchTool, a free program that enables almost anything you want, including the ability to customize three finger Expose, and single / two-finger tapping. The computer mouse lived longer than many ever anticipated. Yep, that's going to be the first line of the mouse's obituary. One day we may navigate every computer with a glass multitouch trackpad, or by simply by touching the screen, but today and for the foreseeable future we're living in a world of subpar trackpads and cursor-based operating systems. We'd love to see laptop manufacturers focusing more on trackpad usability, and we're hopeful that Apple and Microsoft are hard at work making their operating systems much more touch-friendly, but until then we'd suggest keeping that Logitech MX or Razer Imperator in hand and well fed.